They can recommend to the court the case be dropped for lack of substance, they can take over the lawsuit from the whistleblower filer, or they can decline to intervene allowing the case to be prosecuted privately with the DOJ monitoring progress with the option to later intervene. This month, the Department of Justice (DOJ) reported it had recovered more than $3.5 billion from civil False Claims Act (FCA) cases, awarding whistleblowers a record high of $597 million in fiscal year 2015. Of the total recovered for qui tam cases ($2.8 billion), a record-setting $1.1 billion was recovered in DOJ-declined cases – an unprecedented six-fold increase from the prior record of $173 million in 2011. Under the FCA, whistleblowers are entitled to prosecute on behalf of the U.S. government even when the DOJ declines to assist with the case. And as credible whistleblower attorneys become more experienced and getting a foothold in FCA courts, private prosecution experienced a windfall this year. To put things in perspective, the DOJ recovered more from declined whistleblower cases in FY2015 than in all previous years combined ($1.15 billion in 2015 versus $1 billion in 1987-2014). For the first time in history, whistleblower awards in declined cases ($334 million) surpassed awards for qui tam cases assisted by the DOJ ($262.9 million). In FY2014, whistleblower awards in declined cases added up to $14 million. That amount skyrocketed 2188% in FY2015. Overall, the DOJ effectively passed up over a billion dollars in FCA cases that private attorneys nevertheless pursued and ended up winning or favorably settling. Yet, rather than suggesting a defect in the system, these figures demonstrate the high-functioning nature of the FCA and its provisions. Attorney Mahany, author of Saints, Sinners & Heroes: Covert Ops in the Wars Against the C-Suite Mafia, has False Claims Act cases at various stages with whistleblowers residing in more than 20 states. Although Department of Justice rules prohibit comment while lawsuits are under seal, Mahany indicates he will prosecute privately any FCA lawsuits the DOJ elects to decline. The False Claims Act provides private attorneys with the ability to represent whistleblowers in the pursuit of fraud cases on behalf of the government. Provisions include an extra incentive for private prosecutors who put in the time and risk that it takes to press on with a whistleblower case in the absence of DOJ assistance. The setup also acts to supply the necessary resources to recover government funds where the DOJ resources could not possibly meet the demands of a growing number of cases. As of this record-breaking year, the days of dropping a whistleblower case due to a DOJ declination letter appear relegated to the past. 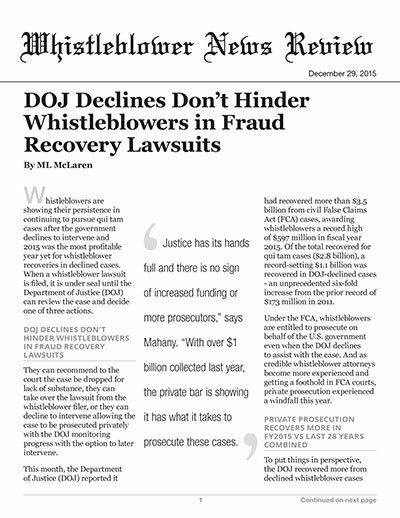 Data indicates that whistleblower attorneys are no longer daunted by going it alone and seem confident in their ability to successfully obtain recoveries despite a DOJ decline.